I finally have a crocheted FO to show; seems like forever since I gotten something off the hook. 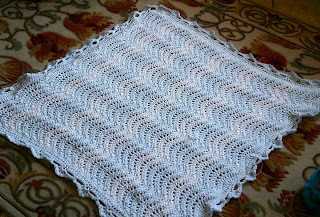 This is a baby blanket for a friend, done using an expanded version of my Feather & Fan Scarf pattern and two stands of baby yarn - 1 solid, 1 variegated - held together. 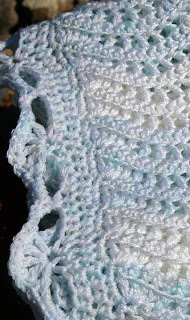 Details are on my Ravelry page here. 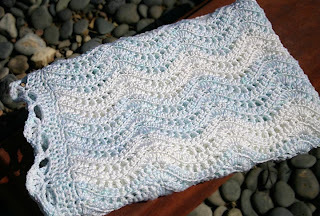 I pretty much made up the border as I went along, evening out the ripple pattern on the top and bottom to create a straight edge, then adding an airy shell edging. I thought the color stripes might be too subtle in the finished blanket - but they aren't. Very happy with how it turned out. What a lovely baby blanket. Well worth your time!